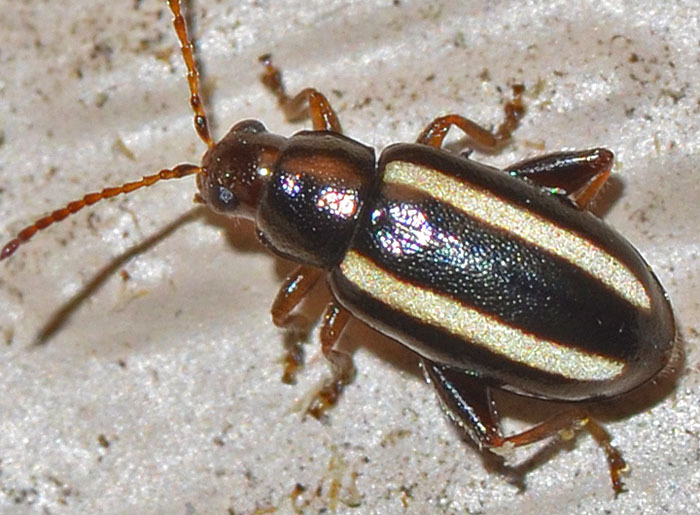 Systena blanda (Palestriped Flea Beetle). Size: approx. 4 mm. Photo: 08/26/14, 9 pm. A pretty, little flea beetle. It seems to fly from May to August and is not a very common find, perhaps partly because of its small size. I believe this little fellow was attracted to our porch light. Notice the enlarged hind femora which makes this flea beetle a good jumper. My specimen, however, was casually strolling on our house wall.